The entire police department poses for a group shot. Photo by Hank Sims. 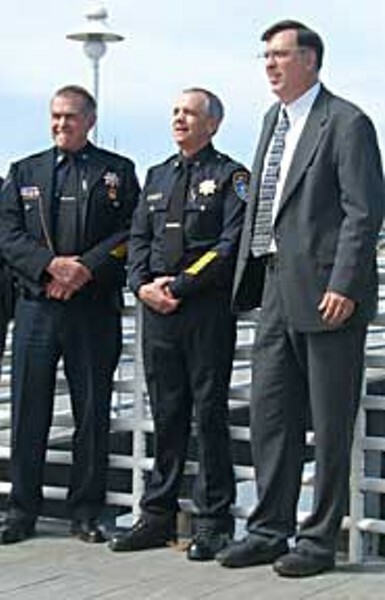 Interim chief Murl Harpham, Chief Garr Nielsen and former chief Dave Douglas. Photo by Hank Sims. Officers of the Eureka Department in formation at the Adorni Center. Photo by Hank Sims. Friday afternoon at the Adorni Center, a brilliant spring day. Seals swam up and down the harbor, clearly visible from the great glass wall on the north side of the big multipurpose room. It was a momentous day. Inside, 37 sworn officers of the Eureka Police Department - just about the entire force, except for a few who were out of town - stood in military formation as the dignitaries and guests arrived. The Sheriff's Office and the CHP took over Eureka for the afternoon so that everyone could make it to the ceremony. The occasion, of course, was the swearing-in of Eureka's new police chief, and the pomp and circumstance that the city of Eureka brought to the event was a clear sign that the powers-that-be wished to give Garr Nielsen, formerly of Multnomah County, Oregon, a reception equal to the hopes that his hiring had inspired. Just about everyone showed up to welcome Chief Nielsen. Delegations from almost every other law enforcement agency in the region, including the Coast Guard and the Department of Fish and Game, were on hand, as were elected officials and business people from across the county. When the time for speeches came, Mayor Virginia Bass squared up to the podium and tackled matters not exactly head-on, but as close to head-on as was politically practicable. She thanked interim chief Murl Harpham, a 50-year veteran of the force, for stepping up to take temporary command "at a time that was challenging, to say the least." Then she moved to Nielsen and took up her main theme - that this was a time of "new beginnings." And also a time to "heal wounds," to "step forward" and to "tackle challenges." Bass never mentioned specifics - unrest following the EPD shooting of a mentally disturbed woman one year ago, and later of a teenager; chronic staffing shortages and low pay; poor morale - but she did acknowledge, obliquely, the last year had been a rough one for the city's police department. And she, like everyone, was placing a lot of hope in the idea that the man from Multnomah, whose reputation and stature has continued to skyrocket since he was introduced a couple of weeks ago, would be able to work miracles. Nielsen was introduced, to applause. He said that he had visited several communities since he decided to strike out on his own; Eureka was special. "It felt right from day one," he said. He knew that the community had problems; he took on the "awesome responsibility" with full knowledge that the citizenry here deserved to feel safe in their homes and on the streets, and that the community had placed a great deal of trust in him. "My goal is, that at the end of what I hope to be a long tenure, that I leave the Eureka Police Department better than I found it," Nielsen said. Then his wife was introduced, and she pinned his new badge to his chest. As he left the podium, he stopped for a moment and spoke without the mic - the sworn officers, who were still standing in formation, were only part of the department, he said; the non-sworn personnel - dispatchers, clerks, evidence technicians, volunteers, were sitting in the first three rows. They made police work possible, and he wished to acknowledge them as well. Capt. Raymond Adgers, a colleague from the Multnomah County Sheriff's Office who came down for the ceremony, later said that moment was absolutely typical of Nielsen. "I know it's a cliché, but the thing I want to say about Garr is 'exceptional service,'" Adgers said. "That man provided us with 20 years of exceptional service, and I know he'll do the same in this community."